Pope Francis enjoys universal acclaim. Almost. While the pontiff is building bridges to Communists in Cuba, nuns who had been under suspicion, Muslims, Jews, Protestants and even people outside the faith, two dissenting groups stand out: Catholics on the Left, in whose eyes he is not moving fast enough with respect to church laws, policies, and theology to effect the changes which they regard as urgent, and Catholics on the Right, who are displeased by almost everything this pope says and does. So predictable are his critics on the Right that we seldom engage in sighting them or commenting on them in Sightings. But never to notice them does a disservice to those who would like a full accounting of the Pope-in-public, the Pontiff-in-the media, etc. So, to remind ourselves that the Rightists are out there, let’s just for once focus on a sample, in order to transmit a bit of the flavor and tone of what they have to say. Out of many choices, let’s notice, as representative, Cliff Kincaid (see “Sources.”). He directs the Accuracy in Media’s AIM Center for Investigative Journalism. The Southern Poverty Law Center people (see “Sources”) list a few score of his victims, a.k.a. subjects. From this “Right” angle, Pope Francis is seen as too friendly to “Liberation Theology” heroes; he “even” greeted Gustavo Gutierrez as an official guest of the Vatican. Let the Southern Poverty Law people take over from here in reporting. They remembered Kincaid applauding a proposed law in Uganda which would impose the death penalty on large numbers of gay men. Get ready for more of these attacks from the edges of the crowd when the pope visits the United States or issues his encyclical. And listen for the sounds of hysterias. Kincaid, Cliff. “The Catholic Church Has Gone Socialist.” Accuracy in Media: For Fairness, Balance and Accuracy in News Reporting, May 12, 2015, AIM Column. http://www.aim.org/aim-column/the-catholic-church-has-gone-socialist/. Keller, Larry. “Cliff Kincaid Takes on ‘Liberal Media,’ Gays.” Intelligence Report 141 (Spring 2011). 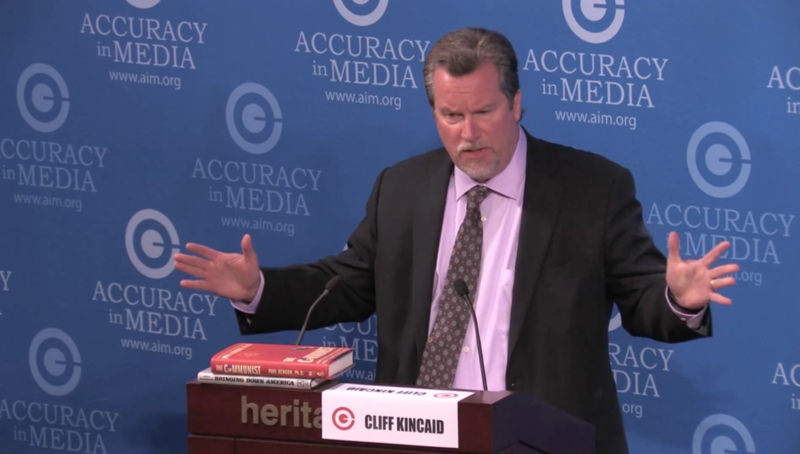 http://www.splcenter.org/get-informed/intelligence-report/browse-all-issues/2011/spring/cliff-kincaid-takes-on-media-gays. Accuracy in Media’s AIM Center for Investigative Journalism.http://www.aim.org/center-for-investigative-journalism/. Southern Poverty Law Center. http://www.splcenter.org. For AIM’s biography of Cliff Kincaid, visit: http://www.aim.org/about/who-we-are/. For Southern Poverty Law Center’s biography of Cliff Kincaid, visit:http://www.splcenter.org/get-informed/intelligence-files/profiles/cliff-Kincaid. Image: Cliff Kincaid speaking at a 2012 AIM conference, "ObamaNation: A Day of Truth;" Screenshot of YouTube video.